The scene where Perseus fought Medusa and the Gorgons in the old Clash of the Titans film always horrified me as a kid. Yet I still felt compelled to watch Clash of the Titans every chance I could get, refusing to look away even though I knew I was going to be scared. I knew that our hero would prevail, but that didn’t lessen the tension I felt while watching his battles. This is the same feeling I had with The Ramayana, even though the story is far less familiar to me. The baddies are out to get our hero! There’s no way he can win! But he’s the hero, so of course he is going to win. 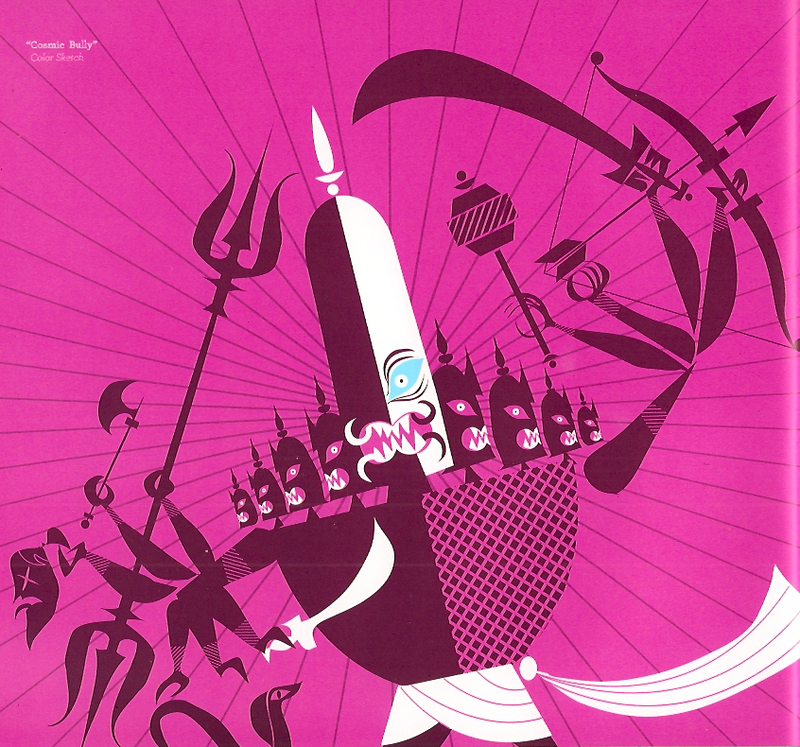 I was first introduced to The Ramayana through watching Sita Sings the Blues a couple of years ago. A friend of a friend had a sneak preview copy and we eagerly huddled around a laptop screen to watch it. 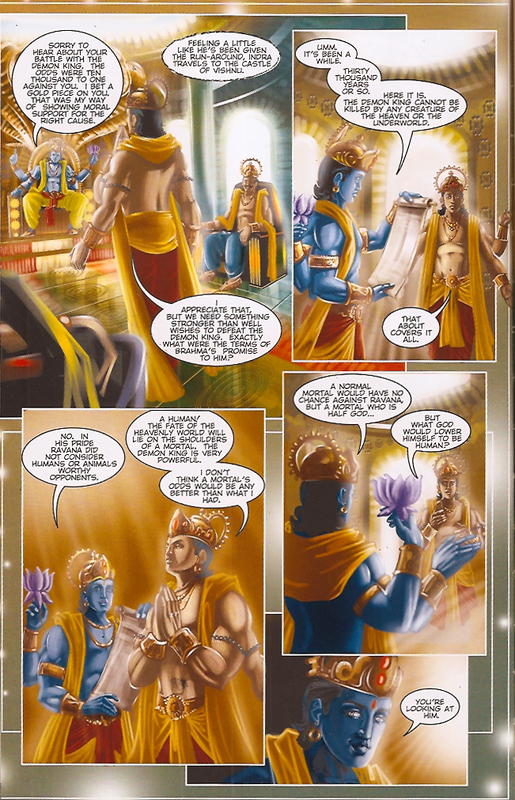 Not only was it my first time hearing the story of The Ramayana, it was my first time learning anything about Hindu mythology other than the vague knowledge that there was a blue guy, an elephant man, and lots of arms and heads on various dudes. Honestly, I was kind of shocked to realize just how little I knew about Hindu mythology, considering that Hinduism is not only the world’s third largest religion but also the oldest of the major religions. 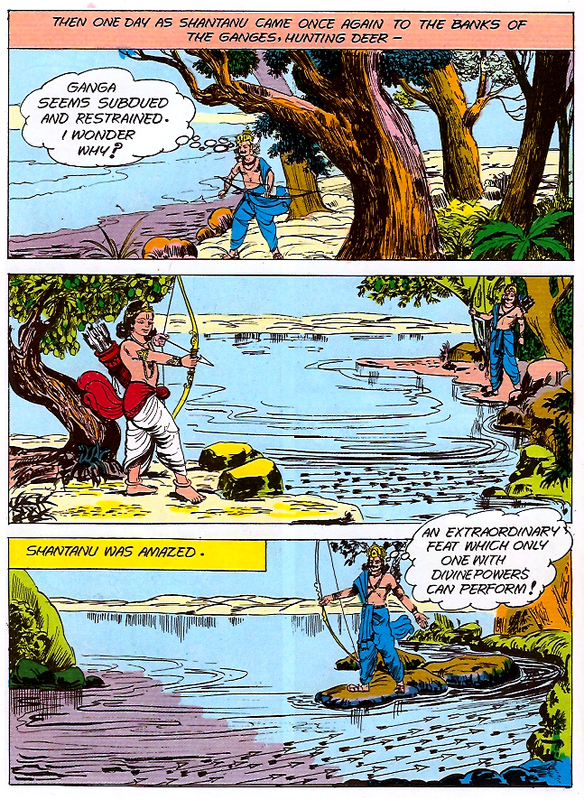 But there I was, 25 and learning about the story of Rama and Sita for the first time. I was smitten. Fast forward a couple of years and I’m hanging out with a neighbor who knows my love of comics. She shows me her copy of Heros from The Mahabharata. 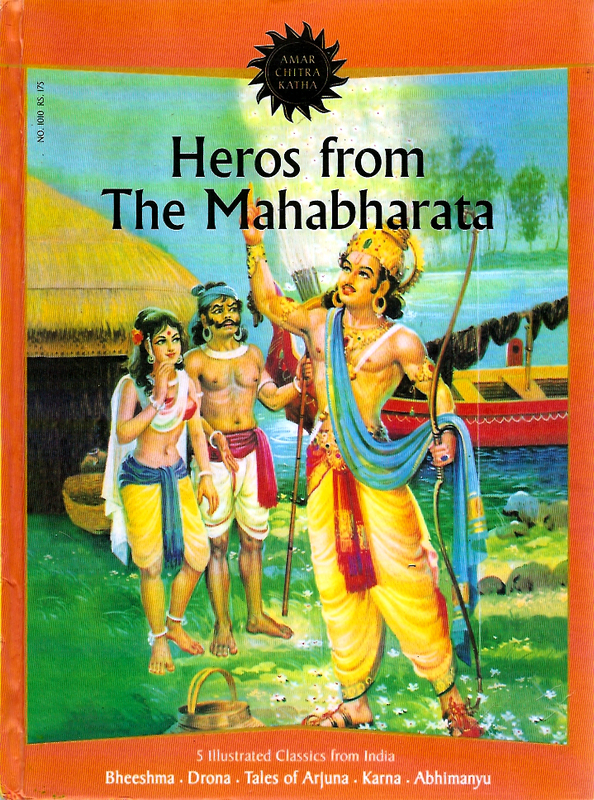 (The Mahabharata, like The Ramayana is one of the major epics of Hindu mythology.) I’m immediately drawn to its cover, which reminds me of the old Classics Illustrated books, and ask if I can borrow it. Inside are five different stories drawn by five different artists. I can totally see how at first glance someone might just write off these comics. The colors are garish, like old newspaper comics or old floppies. The text is frequently misaligned in the bubbles. The writing is a bit stiff and clunky. “Pulp” is the word that first springs to mind. However, a closer look at the art reveals some truly lovely passages. The panels and pages seem to be laid out with great care about page flow. What excites me most about this book is how the artists use the simplification of line and shapes along with the page layout to impart an amazing energy to the work, particularly the battle scenes. The art really outshines the stories here. I would keep this book around just for my own visual reference. 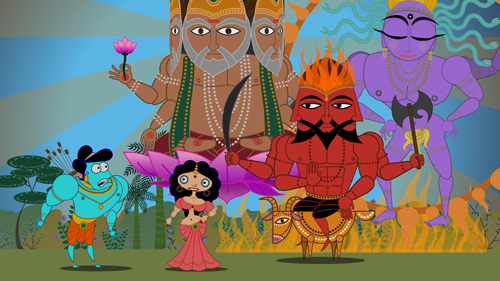 My next foray into the world of illustrated Hindu mythology does not prove as fruitful. 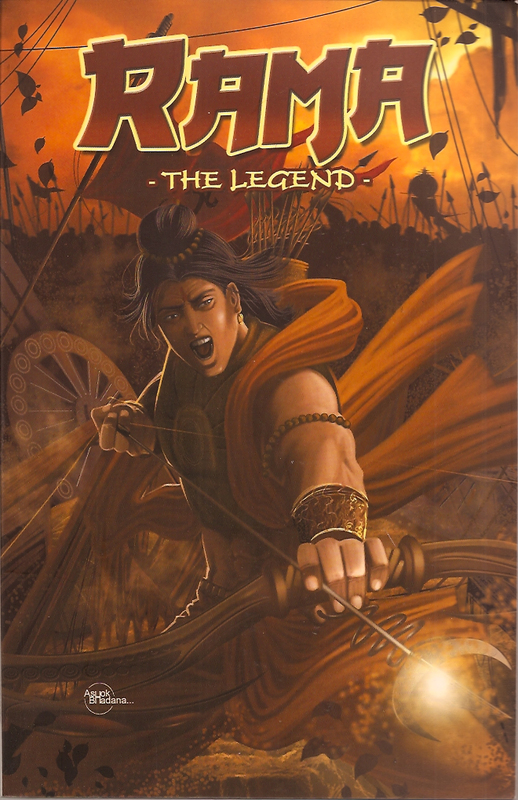 Rama: The Legend, a retelling of The Ramayana, is a disappointing read. 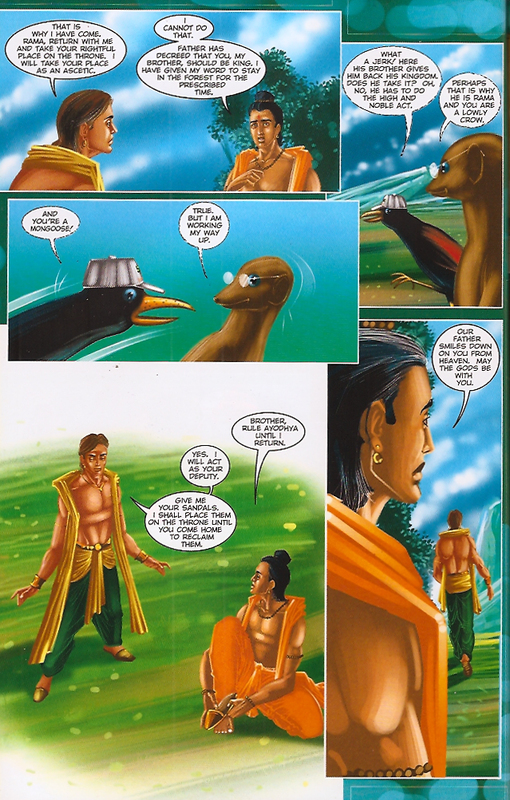 The story is less stiff than Heros from The Mahabharata, but the addition of Rarecrow and Raj the Mongoose as characters “to help bridge the gap between the western and eastern cultures” (as stated in the introduction) seems forced and a tad patronizing. I found myself cringing every time they appeared and started dreading their next appearance. As an additional disappointment, the artwork only serves to detract from the story. The figures are stiff and quite frequently fall into the uncanny valley of trying to be realistic but ending up slightly off. Particularly, I kept being distracted by the unnatural positioning of the heads. Furthermore, the heavy use of digital gradients and airbrushing effects combined with the seemingly disorganized use of paneling and page layout constantly distracted and disoriented me. The only good thing I can say about this book is that it is a stunning compilation of what not to do. Reading it felt more like doing homework than anything else. 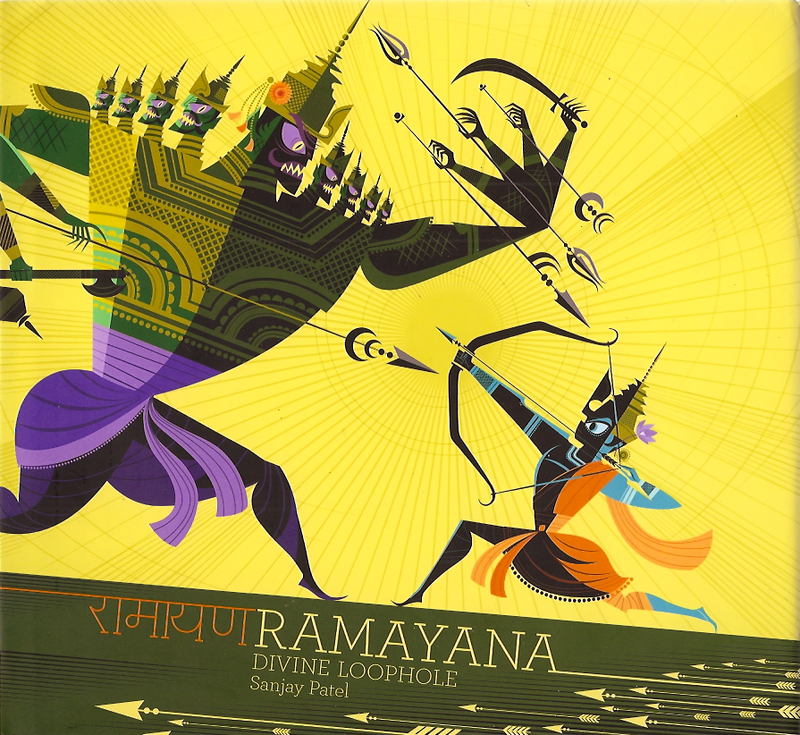 In sharp contrast to Rama: The Legend, is Ramayana: Divine Loophole. This book truly was a pleasure to read. Sanjay Patel’s use of a vivid palette combined with his well-honed sense of design creates characters and page spreads that are memorable and enjoyable. 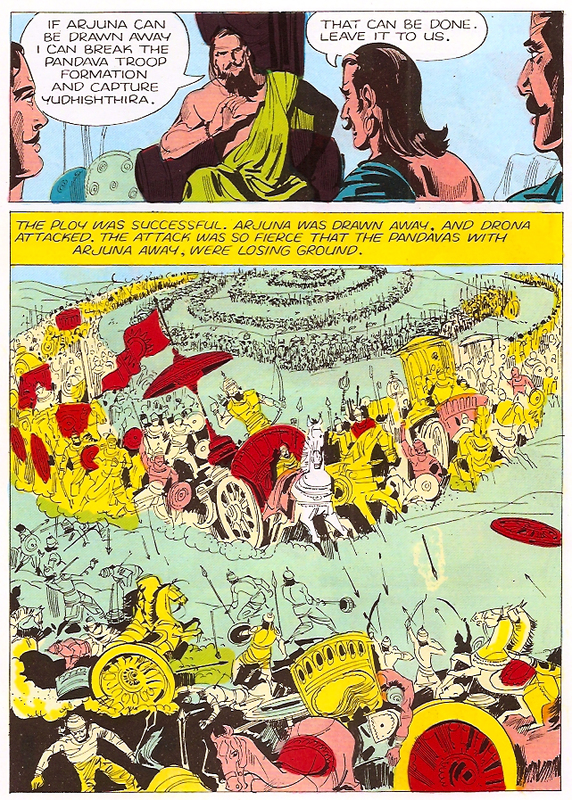 Unlike Rama: The Legend, his use of the digital actually enhances the book instead of detracting from it. Although this is technically an illustrated book and not a comic, the book feels true to the spirit of comics. The words and pictures go together beautifully and serve to enhance each other in a way that is more than the sum of their parts. Ramayana: Divine Loophole is a book that stands strong as a whole and that I will happily keep on my coffee table for years to come. In fact, after reading Ramayana: Divine Loophole, I was so inspired by the story of The Ramayana that I insisted on retelling it to my wife. She patiently listened to me recounting every battle, telling her of Rama’s strength and how he eventually defeated the evil demon lord Ravana despite all odds. It felt like I was a kid again, telling a friend about Perseus battling Medusa.